Look! I'm 22.5 inches and 10 pounds 6 ounces! I'm a growin'! Bella checkin' out the Carousel at Disneyland...oooooh, bright shiny lights spinning round and round! So much to share...ok, here goes. Thanks to the inspiration of the thousands of success stories on The Secret website, the book The Secret, and the coaching of a dear friend, I am going to share 1 MONSTER INTENTION and 2 breakthroughs I had today with all of you. Since even before her birth, her body has had open wounds. Remember, she was born without any skin on much of her left leg. She has never known any other experience than having open wounds. Today, she coos, giggles, smiles, and interacts as much as any baby at 2 months we've ever met. Yesterday I cut my finger at the fingernail playing my guitar and it HURT. Bella has many more times the wound I have on my finger, and she goes through her day like she doesn't have any. How can that be? Because she has never known anything else. Like water to a fish, her wounds are invisible to her. Sure, when she cracked that hole in her leg, it was pretty visible, but as her many wounds are in a perpetual state of healing, she just sleeps, eats, HEALS, and goes through her day like any other kid her age. She doesn't know she has EB. she just is. We're the ones all messed up over her diagnosis. It was inside of this revelation that her EB disappeared to me. I don't see it any more. I just see a cute, sometimes fussy, 2 month old who is so cute that when she is making eye contact with me and smiling, I am frozen in time in a state of bliss, wonder, amazement, and total love. Time stands still when she smiles at me, or even more so when I see her smiling at mommy or Ali. She LOVES her big sister. It is truly magical. I didn't realize when I was creating the vision that once she came home from the hospital [the EB] would go away, it was for me, not her. Perhaps you did, perhaps not. Either way, thank you for holding your vision along with me. Miracles occur. in His or Her own way." Thank you God for taking the EB away, and revealing the perfect angel within. That is who I see now. I am so blessed by You God, thank you for the miracle that she already is. I realized today that there is no difference to God/The Universe between 1 dollar and 1 million dollars. We humans are the ones who value money and we humans declare that making a buck is easy, but making a million bucks is hard. A million bucks is simply 1 million easy bucks made. If 1 dollar is easy money, 1 million dollars is A LOT of easy money. There is no "hard" involved in the equation. Grass doesn't strain to grow. My daughters do not strain to grow. In fact, they grow in their SLEEP. "Hard" might just be an invention we humans created to justify when results don't meet expectations. So. It is my job to declare and share my vision with clarity to The Universe, without "knowing how," because it has been demonstrated time and time again, that when you declare your intention, then events and people line up in alignment with that vision. Last summer, I completed my internship in San Diego. I did not want to commute 90 miles each way each day for 6 months, so I created that someone in SD would allow me to live in their home FOR FREE while I completed my internship. I BELIEVED that God wanted me in SD to do the work I was doing with developing NICU MT, working in Hospice, etc. I genuinely believed that God has provided for me this whole journey to California and through music school, so why would God stop providing for us then? So, without knowing more than one family down in SD, I just began DECLARING that it be so. Well, long story short, one night, I got an email from a woman I had never spoken to explaining to me that she had a home for me to use. Not a room, a HOUSE. Turns out, they were relocating to Michigan and were putting their house in La Jolla on the market. I could live in it for the entire internship, unless it sold. Again, I had NEVER EVEN MET THE WOMAN! I ended up with a 4 bedroom home in La Jolla, CA 10 minutes from my internship site for free for 6 months. 2) All we need to do is get clear about what it is we want, declare it into existence, and believe it can be so. Anyhow...I share all that because I need to be reminded that I have already created from nothing many many times. In fact, I declare that I am blessed to be a master of manifestation! I am a master creator! I AM DECLARING TO THE UNIVERSE THAT I AM MANIFESTING $1.2 MILLION DOLLARS IN PERSONAL INCOME BY MY BIRTHDAY ON AUGUST 31, 2009. 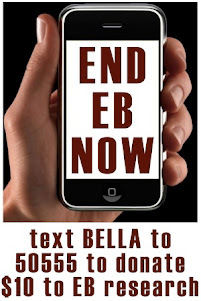 $100,000.00 will go to DebRA and another $100,000.00 will go to the EBMRF. That leaves $1 million for my family and me as a gift from God/The Universe. Who wants to play this game with me? If you want to hop in the sandbox and play, send a post simply stating," I AM IN." We'll iron at the details as they are revealed, and let me tell you, they are already at work in ways I'll be telling you about real soon I'm sure. At first, I was PETRIFIED to share this with all of you, for fear that you might think I've gone off my rocker. However, after reading this over, I am actually filled with humility, confidence, and GENUINE BELIEF THAT IT NOT ONLY CAN BE, BUT ALREADY IS. Time just now needs to catch up with the vision I hold in my mind. Will you hold it with me? Even if you don't want to jump in, I humbly request that you set aside any judgements or fears, and BELIEVE IT CAN BE, and HOLD that space open for us. May my words convey the love and gratitude that I have for you that you take the time to read this and generate this possibility with me. May God bless you all, and I look forward to hearing from you! There is a ring finger under that blister somewhere. She never even made a peep about it. We took off her mitten and almost fainted! Seems like I'm not getting around to this site as much recently. I think there are two reasons for that. 1) New developments on Bella's condition aren't emerging with the same speed as early on. We are in a routine of care that involves dressing changes every other day. We almost made it through yesterday's dressing without having to break out the needle (to pop a new blister), but alas, we found a big one on her left knee when we undressed the final appendage of the session. So, pretty much every dressing change follows the same sequence: right hand, right elbow, right leg - switch Bella around on table - left hand, left elbow, left leg. Each time, there usually is at least one new or recurrent blister, and the other existing blisters take 1-4 weeks each to heal, depending on severity. It still takes 30 minutes of prep and 1 hour of treatment. It's not getting any faster, but it's getting easier. The fingers are really Bella's biggest problem area. They just can't seem to withstand any impact with any objects without BALLOONING. We have to wrap 1-3 fingers on each hand almost all the time due to some recurrent blister blowing back up. That's a drag. The good news is that Bella's left foot will be totally closed again by tomorrow when we redress it. It has been healing fabulously. Take the good with the bad seems to be the name of the game. ...really, I was fearing that you all would eventually wear out from the constant writings and would just go away. So, I beat you to the punch by pulling away first. Call it a trigger-finger defense mechanism...if I leave first, you can't hurt me! Yep...I admit freely that I made it all about me and not Bella. No biggie. Just me being a human. Just typing this offers me the gift of reflection; I hadn't seen that this is what I was doing till I started typing this! Ah...insights. They never get old. In other news, Bella's 2 month check up was yesterday. Can't believe it's only been 2 months. Feels A LOT LONGER THAN THAT. 10 pounds 6 ounces & 22 inches. 40th percentile in height and weight, 70th percentile in head circumference. Doc thinks she looks and sounds good. Music to our ears. We took the family to Disneyland on Friday night! We went for a meal and a 2 rides for Ali in Fantasyland. It was a success! Ang bought an AWESOME new double stroller (1 up front & 1 behind) and we took turns going on rides with Ali while the other chilled out with Bella. Bella loved the lights! It felt great to do something 'normal' as a family. That is going to be key in all this I can see. Ali started Horseback riding lessons on Saturday. She left crying because they didn't give us an itinerary for the 4 week program till we arrived on week one, and in session one, the kids learn to clean and bridle the horse, so Ali was really sad since she thought she was going there to RIDE a horse. Now that we have the itinerary, we can prep her accordingly. Good job, City of Orange. Maybe send out the itinerary in advance? I'll pay an extra buck to avoid having my kid crying after day one. Gift certificates and food continue to flow into our home from near and far. We are so blessed by the abundance of love and support we ongoingly receive. Thank you all for all of it. It is overwhelming, and it is a great feeling. 2) watch the kids for the whole weekend in Nov. so we can get away to Disneyland for our anniversary and be kids ourselves! Ang's mom came and cleaned today while I was at work, and when I walked in the door...it was magical. It felt so...clean and orderly...I could feel it as soon as I walked in, even before I realized what had happened. Then, I went into the bathroom and as I was washing my hands, I could see my reflection in the faucet...that really gave it away 'cuz I NEVER clean the faucet that well! Having a clean house makes me feel so much more at peace, it's amazing. Thanks again grandma for providing that peace! We love you! Okay, good night. When the Care Pages photo gallery is working again, I'll post new pics and send a quick update. Thank you all again for taking the time to read this, send prayers, cards, gift certificates, positive thoughts, energy, vibes, wishes, et cetera. It all matters, and it all contributes to all of us and we are eternally grateful. My daughter has 100% POTENTIAL!! Bella gets new blisters, and heals old ones. Mommy and Daddy get better and better at dressing changes. Nanny (my mom) is helping around the house and we're all still beat at the end of the day! Ali is regressing on potty training...heard that might happen, but figured it would have happened closer to Bella's birth. Tonight, we have to start making formula as a backup...sugar is the first ingredient in formula and Bella and Ang have been sugar free since week 2...not sure what effect that will have. Say a prayer that tomorrow, Ang's Doc calls back. There is a prescription Ang can take that will hopefully stimulate more breast milk production. Ang has a sinus infection. Say a prayer for her immediate healing, please! Mommy and Daddy got to see Coldplay live on Ang's birthday on Saturday night! Tim was 22 rows up from seeing David Beckham and Ronaldinho on Sunday at the Galaxy v. AC Milan match! I was talking to a friend who was remarking how impressive Sean Stephenson's story is and how nice it was for him to spend 45 minutes on the phone with me. My friend said, "It's amazing; he's this little guy in a wheelchair, but he's so powerful!" Sean Stephenson's power comes from his mind and his spirit, not his 3'2" frame, though that frame was the catalyst that led to him honing his mind and spirit into the powerful entity that it is today. And, so, too, may it be with Bella. All through my adult life, I have been honing my mind and spirit, because I believe that I leave my body behind, but not my consciousness. I figure it's an investment that will pay returns even after I die. However, I have been relating to Bella like the quality of her life will be determined by her body. NOT TRUE! I take responsibility for that fact that I made that up on my own. The quality of her life may be informed by her body, but it is not the source. That will come from within. Her source of quality will be her mind and spirit, and THOSE ARE PERFECT IN EVERY WAY AND IMPERVIOUS TO EB! She is free to create her life as powerfully as she chooses, despite what her skin says. My daughter has 100% POTENTIAL!!!!!!!!!!!!! Many times, I have thought about what Bella can't do, and have missed out on what she CAN DO! After all, Sean served in President Clinton's CABINET!!! Oh the things you will be able to do, sweet Bella! The world is truly your oyster! Good stuff. Good stuff. God is good. ALL THE TIME. SEE just one thing God has blessed you with specifically today. Once you recognize it, post it briefly on the message board for everyone else to read, then, you can come back later and read how God blesses us all with just what we need every day. Just remember, the blessings are already around you, you just need to believe they are in order to see them. Has it been a week since the last post already? Was I really that traumatized by last Thursday? Were you? Actually, things have been smooth since then for the most part, but we are as busy as ever. I am working a little part time right now, and while it's only 11 hours over 3 days, I feel like I'm working way more. Maybe because we are still sleeping way less? My mom is in town for ten days helping out, which has been just great. She is the brightest ray of sunshine in any room. No matter what kind of day she is having, when you interact with her, you get nothing but genuine happiness to be with you. She is so present, and has such a JOY and zest for everything life has to offer. She is and has always been an amazing role model. She is teaching Ali to swim and helping straighten and organize the mess that is our house. Man, I love my mom. Bella's acne is gone! No scabs on her face, save a few on her left ear. The baby acne actually did a number on her ear for some reason, but it is all healing, as it always does. She just has the most beautiful face. I am mesmerized by her beauty (when she's not screaming at me). Her foot is healing well after "the bath episode." We are using a new product called Elasto-gel on it and we like the results. You wouldn't believe the extent of the damage, though. Frankly, it is a bit intimidating how much damage she did with one heel strike. She kicked the inside of her instep, and the wound extended all the way around to the bottom of the inside of the arch in one direction, and out to the 5th toe in the other direction. All the skin just sluffed off. She hasn't slept much in the past two days and we wonder if it is because of the discomfort from the wound going through its motions. She still eats like a champ and is up to 3 oz per feed. Mommy has been struggling to keep up her milk supply, so would you please take 30 seconds and visualize an abundance of milk filling the fridge? I remind Ang that she has provided all the milk Bella has ever needed, but we have to dip into the reserves in the freezer almost daily right now, and I can see it must be stressful being responsible for feeding your daughter, but not feeling in control of how much milk you produce. As the guy, all I can do and stand beside and support her and encourage her to take her fenugreek (and eat her oatmeal in the am). Visualize milk, please! Thanks! I recently purchased "The Secret" on audio CD. I owned the movie a few years ago and loaned it out permanently, then got the book as a graduation present, but who has time to read? So, while I'm driving, I get a good dose of inspiration and coaching. Like anything, there are parts that are just awesome, and parts that I find a little cheesy/fluffy (like the reason all overweight people are fat is because they think fat thoughts). There are two main points that have really helped this week: Thoughts are creative, so manage your thoughts. and Visualize what you want. Here's my little "Secret Story for the week:"
I needed to pick up my mom at the airport on Tuesday night, but was running late. I live about 5 miles away from the freeway, and the street that gets me there is a busy, main drag full of lights. It can take 6 minutes or 12 minutes to get to the freeway depending on how you hit the traffic lights. I told my mom I would meet her at the baggage claim and really intended on keeping my word, so I visualized green lights all the way to the freeway...and got them! Then, I visualized me being there at the bottom of the escalator and saw my mom coming down the escalator in my mind's eye. Finally, I visualized the exact parking space at the airport that would be closest...I've been there enough times to know exactly where that is. I saw it waiting for me, so I could deliver on my intention. Well, at the last second, I made a wrong turn pulling into the airport and went up to the roof of the parking structure by accident. I found a good spot (not THE spot) and went down the stairs and walked into the terminal. I walked right up to where everyone waits, and didn't even have to count to TEN before I saw my mom coming down the escalator EXACTLY as I saw it my mind while in the car. The best part? As we were walking out to the elevator, I looked at the very parking spot I visualized...and it was vacant! I just laughed, and told my mom the story. I have caused parking spots to be available at airports before, but not in a while. It's been nice to get my mind focused again on CREATING life, not REACTING to it. Last but not least, I want to take this opportunity to acknowledge I had a loss of faith for a little while. You may have noticed I stopped generating the vision I created for Bella's future. Truth be told, I gave up. However, after listening to The Secret and being reminded that every single thing in existence made by humans was first a thought, then a word, I realized that I have a choice. I can choose to continue to generate a miracle in the face of reason, or I can be reasonable and give in and take what I get. I choose to generate a miracle by declaring that one day, Bella will look back and say, " Yeah, I was born with this rare skin condition, but when they brought me home from the hospital, it went away." Please REJOICE in GRATITUDE with me that this miracle HAS ALREADY HAPPENED, and we are just simply waiting for time to catch up! THANK YOU for participating in the miraculous healing of Bella! We are honored to be your partners in her transformation. May God bless you with abundance in all things this very day. Good night! Big Day today! Bella's first bath. Boy, that didn't go so well, but more on that in a moment. First, the day started out at the Doctor's office. Of all the diabolical things for Bella to have...she got a mad case of BABY ACNE. It started out as what we thought was a rash, but over the past 24 hours, her face just erupted and began to look REALLY bad. Her pediatrician, Dr. Bindra, took one look at it and said, "Yup, baby acne, and I can see it's gotten infected in several places on her face." He used the "I" word, and we shuddered. Infections are one of the big 3 killers of DEB kids, and we swore we'd keep her infection - clean. It just happened so fast. Bella beats her self up with her hands and scrapes up her face despite the round the clock gloves and socks we put on her. Yesterday evening, her hand snuck out of the glove while she was swaddled, and while she was in my arms, I watched her reach up and gouge a inch long gash in her right cheek. By the time I got my hand to hers, the damage was done. It is INSANE how little effort it takes to peel off her skin. Anyhow, he wanted to put her on oral antibiotics, but we asked if we could treat it topically first; Dr. Dahr at CHOC warned us that we were in for the long haul with wounds, and to use antibiotics judiciously so as not to create a tolerance for them over time. Dr. Bindra was okay with that idea, but he wanted us to switch the type we're using at home to a little more potent topical ointment for this to catch it off guard. So, we started her on the antibiotic ointment as well as another topical scar treatment, and her face already looks like its getting back under control...a little. Okay, so we figured the worst was over for the day (Bella screamed just about the whole time at the Dr.), but alas, we were wrong! We had heard that bath time and wound care are the most stressful times for the EB family due to the pain involved for the patient. We have really been waiting to get the left leg fully closed and healed before attempting any such endeavor. Well, today was the day. We decided there's no way to do it but just do it, so we got prepared (or so we thought) and stripped Bella down. There was a really great moment before the bath began when we took all the bandages off both legs. Diaper was off, and the only dressings were on Bella's hands. To see her two legs in their entirety, and her feet with all those cute toes...oh it was AWESOME! With one kick of the right heal, Bella scored a direct hit on her fragile left ankle and tore the skin right off it. She left a hole the size of a nickel, but that was just the tip of the iceberg, The trauma ruptured the skin all the way around the hole another 2 inches in diameter, and it began to fill with fluid, then drain through the wound, then fill with fluid, then drain. It was surreal to watch. As I tried to dab bacitracin on the wound before wrapping it, the bacitracin stuck to my finger and stuck to the loose skin around the wound, and as I pulled my hand upward, a giant section of skin just lifted right off her leg, showing how big the wound really was. It was one part open wound, one part giant blister. To put it in perspective, the wound would be about 6 inches in diameter running up the inside of my shin from my ankle. One kick. What's worse is it happened literally as I was saying, "We gotta isolate that leg before she..."
Again, it just happened so fast. I was brought back to the day where the boot came off on the changing table, and we were out of hands. Today was one of those days. I don't know HOW we got her out of the bath and cleaned up, but we did. Normally, Bella's screams and cries sound like anger, but today, we heard pain like never before. Even after, while asleep, every couple of minutes she let out a cry that just cut straight through. It took 6 weeks of wound care to close that leg. Now we begin again. On the bright side, we received a welcome care package from DebRA yesterday that had a host of different wound care products and cloth diapers, all different from what Leslie brought out to us! In it was a product that works 100 times better on her fingers than the one we've been using, so I am really excited and re-energized about healing those fingers. You just gotta take the good with the bad. I am also reading Sean Stevenson's book called "Get off your 'But'. When I spoke to him, he told me to read the first chapter because it details what it was like for him and his parents dealing with OI (aka brittle bone disease). When he would break a bone, his parents had to immobilize him at the location of the accident for 6 weeks....not the location of the break...of the accident...which means that on Halloween when he was 9 and broke his FEMUR crawling around the corner in the living room, he literally spent the next 6 weeks in that spot on the living room floor healing. Yesterday, I played classical guitar for a patient of mine who I used to play native american flute for when she would come in and receive her chemotherapy at the outpatient cancer center at the hospital. She was referred to me for "end of life" treatment. I didn't realize it was her until I walked in the room. Her husband was in the room as well, as he always was in the past, but now they both looked so very sick, and just beaten. It had been since mid May since I had seen them, and what a turn for the worse life took them as well. Normally, her husband was strong, but yesterday, he was so tired, weak, and distraught. He cried while I played. My suffering was quieted in the presence of theirs. I used to think that due to earlier life tragedies I have weathered, that I somehow had 'paid at the office' and was therefore entitled to live out the rest of my life suffering-free. I am humbled by the vastness of the sea of live we swim through. It is so broad, and I am so small. There is comfort in this humility, because if God can pour such endless support over such a tiny being like my daughter, than there truly is grace and peace available to every living creature on the planet. It is our job just to look for it. It's there. In the face of the next person we pass. In the vista of yesterday's summer sunset that I watched with Ali in my arms. In the card from a church member. In the OVER 400 messages of hope and love you all have left us on the Care Pages site, not to mention the separate emails, phone calls, and cards. With all this grace and peace around, it truly is a shame that people go through life missing it. I am blessed not to be one of those people. I thank God for blessing me with Bella, Ang, and Ali, and I thank you for blessing us with your love. Wanna Hear How Strong Bella Is? Good evening/morning wherever/whenever you are when you're reading this! Well, we went to the lab to get Bella's blood drawn this morning to find out if her version of DEB is Dominant or Recessive. The test costs (somebody) $6,000.00 and will take 12 WEEKS to come back. I say (somebody) because while we like to think that everything is covered by insurance, we know that this is not always the case. So, with every new bill, we just wait to find out how it all gets ironed out. For example, the Clinical Psychologist in the NICU met with me for 1 hour, then dropped by one day for about 10 minutes, then we chatted one other time in the hallway for about 10 minutes. The bill? $3,900.00. I still can't figure that one out. I wouldn't blame our insurance if they didn't cover such a ridiculous fee! Okay, okay, sorry for the venting. Yeah, there were 10 HANDS on her. She was practically levitating off the table. Luckily, the phlebotomist got it on the first stick, so it really didn't go that bad...oh, and that was in the morning when Bella sleeps, and she was sedated with Tylenol with Codeine. Unfortunately, Bella has broken out with a strange rash on her face and torso that is turning into what look like hundreds of tiny blisters. And yet, her demeanor continues to improve. This disease is so confounding. We can't figure out what we did wrong to cause this breakout. We are just left with the fact that this disease, once again, is NOT IN OUR CONTROL. It is SO HARD as parents to be with that. We just want to overpower anything that comes her way with love, nurturing, and smart, informed care. Yet, even with all that, this thing will run its own course, and I realized that just because I surrendered to EB a few weeks ago, I have to continually surrender to it. That has been tiring lately. Thank you all for your continued prayers and support. Again, we are maxed out physically, emotionally, mentally, and spiritually right now, and just don't have the strength at the end or beginning of the day to generate the intentions we would, so you are doing that for us and we thank you. We also realize that by caring for Bella in the hands-on way that we are IS generating the best for her...it just never feels like enough, ya know? May God bless and keep each one of you today, and may God's abundance shower you with love and grace. In return, may you walk through today filled with love and gratitude for what you give and what you receive. If you keep love and gratitude in each moment today, not only will your day be increased, but mine will as well, knowing that you walk in the Light by doing so. Well, hello everyone. Sorry it's been a while since any updates. Well, that's because there hasn't been much to update about. Bella's old wounds get better, but she continues to get new ones. One step forward, one step back. We are struggling with the reality that this is what it will be like every day of her life. We've been praying so hard for things to just "go away," that new or recurrent blisters almost feel like slaps in the face. We feel like somehow we are letting her down. Some of the blisters go away and stay, some just keep recurring. It makes us question whether Bella will ever be un-bandaged. One day at a time. One day at a time. The good news is that her gas is subsiding. After just about a week on Zantac and Culturelle, coupled with Ang discontinuing spinach (spinach gave Ali bad gas as a baby), Bella has been mellow, almost serene today. That's a good thing because yesterday she was miserable all day and evening. We were told there would be good days and bad days, and those EB parents were right! Here's a great Providence story from this past week I forgot to write about. While at the EBMRF picnic last Sunday, a woman stopped me to ask me if Bella was an EB baby. She said her granddaughter had EB and she wanted us to meet her. Her name is Noelle, she's 8 , and lives in Irvine. The grandma wrote Noelle's mom's name and phone number on a piece of paper for us and we all went on our way. Two days later, our neighbor Robert dropped by. Robert and his wife Katherine gave birth to a boy, Julian, three weeks before Bella. We don't know them well at all, but when they found out about Bella's condition, Robert came over and told us if there was ANYTHING they could do, let us know. 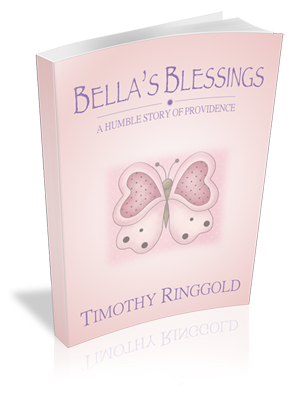 Anyhow, Tuesday, Robert appears at the door with a gift for Bella! We talk for a little, then get back to dinner. As I open the box, a cute baby outfit awaits inside along with a card. As I read the card, there is a P.S. paragraph on the left side of the card. (You know, the part where you actually write something personal). Anyhow, the paragraph reads, "We want you to know that my sister in law has a daughter with EB and would be happy to talk to you and help out in any way. She lives in Irvine and..."
The name and number? Same name and number that was written on the note from Grandma. Katherine had no idea we met her niece just two days prior. In a metropolitan area filled with millions, and with a diagnosis of only 10 in a million, what are the odds? Too great for coincidence, leaving once again, only Providence. On a separate note, I went back to work at UCI Medical Center this past week. I work in oncology, and the two sessions I had with two patients while they underwent chemotherapy were two of the best sessions of my brief career. The level of empathy and empathic listening was unparalleled, and the authenticity I was able to tap into created such a safe space, the two patients opened up about all sorts of things related to their journey through cancer. One patient even recalled the birth of her child and having to go home from the hospital without her due to her being only 4 pounds. No one can explain to you what that is like. It is the most "wrong" feeling on the planet...like there is something terribly wrong with the planet and there is nothing you can do to undo it. I realize that my own suffering has created a new level of connection with my patients, and I am grateful for the tender sessions we had this week. There really is always something to be grateful for, sometimes it just takes a little reflection to see it. Thanks to you, this site allows me the opportunity to reflect and share these reflection with you. Your feedback continues to strengthen us as we brace ourselves for the marathon that we thought was just a sprint. May the abundance of God's blessings be upon each of you today.